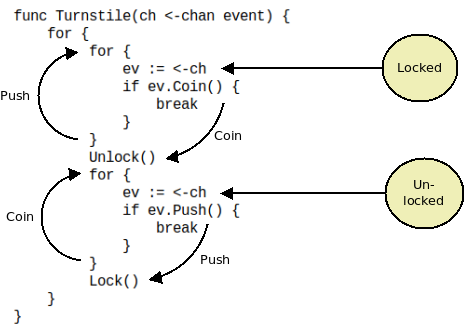 In the past I often referred to the equivalence between state machines and coroutines as a kind of obvious fact that doesn't need any additional explanation. It was brought to my attention, however, that that may not always be the case. This article therefore doesn't attempt to express and deep and ground-breaking truth, rather, it illustrates the equivalence of finite state machines and coroutines using a practical example. A turnstile, used to control access to subways and amusement park rides, is a gate with three rotating arms at waist height, one across the entryway. Initially the arms are locked, blocking the entry, preventing patrons from passing through. Depositing a coin or token in a slot on the turnstile unlocks the arms, allowing a single customer to push through. After the customer passes through, the arms are locked again until another coin is inserted.